We’re all reminded of just how important sleep is when our kids don’t get their nap and lose it before dinner’s even started. But just how important is a good night’s sleep? Chronic sleep deprivation is linked to poor physical and mental health – including weight gain/obesity, diabetes, heart disease, weakened immune system, poor growth, anxiety/depression, poor memory, and ADHD symptoms. Kids grow while they sleep. Our bodies and brains “clean up” and detoxify the day’s toxic load while we sleep. Did you know that our motor and cognitive performance after staying awake for 24 hours is like having a blood alcohol level of 0.10%? At that level, we can expect to have significantly impaired motor coordination, loss of good judgment, slurred speech, impaired balance, vision, reaction time and hearing, and sensations of euphoria. Ever wonder why your kids are so revved up and slap happy and revved up when you know they’re totally sleep-deprived and exhausted? 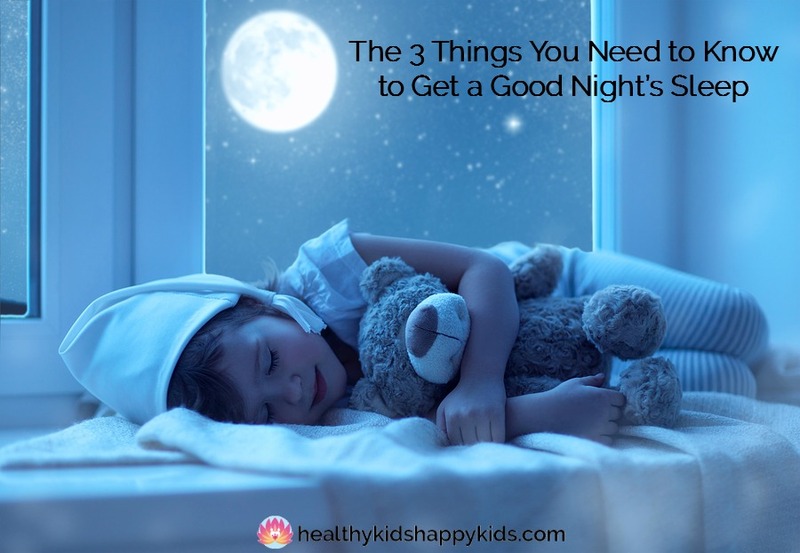 Here are the top 3 things to know to get that elusive good night’s sleep! E (Environment) – sleep in a dark quiet room with no pets; decrease EMF by turning off wifi, move cell phones >6 feet away from your bed, use battery operated clock radios. E if also for Eating – see the awesome nutrition tips from Kandice Stellmon’s blogpost, Eat Yourself to a Good Night’s Sleep. A (Activity) – do stimulating aerobic exercise early in the day and relaxing yoga exercises in the evening before 8 pm. R (Routine) – establish regular sleep and wake up times. The sleep time between 10pm-1am is the most valuable, so adjust your sleep time accordingly. Bed = sleep. Go to bed only when sleepy and stay in bed only when asleep. N (Napping) – nap less than 30-60 minutes a day for school-aged children. If naps during the day mean your child is coming out of bed at 9pm, 10pm, then 11pm and you’re pulling your hair out, consider skipping naps altogether. S (Substances) – alcohol, beta-blockers, antidepressants, benzodiazepines, narcotics, antihistamines, decongestants, antipsychotics and stimulants can all affect sleep stages and timing, so minimize use when possible. An extra word on LIGHT: Our “master clock” is reset on a daily basis. Blue light tells our brain it’s time to be awake, and melatonin secretion from our pineal gland tells us it’s time to be asleep. In nature, blue light occurs in the early morning hours to tell our brain to wake up and get ready for the day. Blue light, though, is also emitted from most electronic screens (flat screen televisions, computers, laptops, smart phones and tablets) and fluorescent and LED lighting. If we’re using any of these devices in the evening, our “master clock” can be reset by as much as 3 hours, tricking our brains that it’s daytime and making it nearly impossible to fall asleep at a reasonable hour. We can do our part as adults, to limit screen time for our kids 2-3 hours before bedtime. But when homework is unavoidable until the wee hours, be sure to use blue light blocking glasses and screen dimming products to counteract this blue light effect on our sleep. Magnesium is truly a miracle mineral. Magnesium helps our minds to unwind and our muscles to relax. It also helps us to fall asleep faster by increasing melatonin levels and helps us to sleep longer! Chamomile tea is safe for all ages to help relax our bodies and minds and get ready for sleep. It settles upset stomachs and helps decrease the worries that have built up throughout the day. Melatonin is our sleep hormone. Melatonin supplementation can be especially helpful for shift work and jet lag. Flying cross country or abroad for the holidays? Just a touch of melatonin for the first few nights at the desired bedtime for the time zone you’re in can do wonders to reset your master clock and get your vacation started on the right foot! 5-HTP is converted to serotonin (our feel-good hormone), which is then converted to melatonin, our sleep hormone. When we’re anxious or depressed, serotonin gets depleted, so it’s no wonder we have a harder time sleeping. 5-HTP supplementation can help with both mood and sleep by supporting healthy serotonin and melatonin levels. GABA is the primary relaxing neurotransmitter in the brain, and can be especially helpful for those who struggle getting to sleep due to anxiety and restlessness. Valerian root is the most studied botanical for inducing sleep and increases GABA while also promoting relaxation. However, it is not recommended during pregnancy and breastfeeding, and can taste quite strong. Stress reduction is key for a restorative night’s sleep for you and your children. Phosphatidylserine and chamomile tea can help to reduce our stress response as above. The 20-minute Ultra Bath from Ultra Mind Solution by Dr. Mark Hyman is another great way to start the relaxation process at night. In the hottest water tolerable, combine 2 cups Epsom salts, 1 cup aluminum free baking soda, 10 drops lavender (halve this for a child). Epsom salts (which is magnesium sulfate) aid detoxification and also increase magnesium levels in our body. Lavender relaxes our body and mind, decreases cortisol, and reduces inflammation. And hot water increases circulation and gets all those awesome Epsom salt and Lavender benefits flowing to all the parts of our body and brain. Avoid stressful situations within 1 hour of bedtime – that includes high-stress entertainment (TV shows, video games, etc.) and even bedtime conversations. Save stressful discussions for the daytime, and focus on positive and uplifting conversations before bedtime. Lovingly read a book and sing goodnight songs with your children. Teach your children how to unwind through progressive relaxation, slow-paced belly breathing, Heartmath, mindfulness meditations or guided imagery. For more tips on how to help your child manage stress naturally, be sure to check out Dr. Song’s blogpost Back-to-School, Back to… STRESS!!! for other tips on managing stress naturally. Last but not least, end the night with gratitude by sharing 3 things that happened that day that you and your kids are grateful for. Send your children off to sleep with positive thoughts and feelings to fill their dreams and get ready for a beautiful new day. So get into a good sleep routine, fill your body with the right nutrients, reduce stress – and get ready for a good night’s sleep!